The Year’s Best Science Fiction, First Annual Collection. 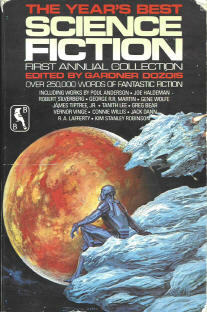 Gardner Dozois. 1984. I am holding off on reading this volume, which I managed to get a copy of in 2002 on eBay. For the moment, here are the contents, and story summaries for those stories I’ve previously read in other volumes. James Tiptree Jr. Beyond the Dead Reef. Nebula novella winner, and rightly so. A complex far future scenario in which humans are being selectively bred and genmod to fight a brood mind menace. Avram Davidson. Full Chicken Richness. Connie Willis. The Sidon in the Mirror. R A Lafferty. Golden Gate. Pat Murphy. In the Islands. When I read this in New Hugo Winners I summarized: “Vergil Ulam has been experimenting with nano-technology – injecting medically applicable biochips into his bloodstream. The initial results are beneficial to him: his eyesight becomes 20-20, he is fitter and leaner. Leigh Kennedy. Her Furry Face. Rand B Lee. Knight of Shallows. George R R Martin. The Monkey Treatment. John Kessel. Hearts Do Not In Eyes Shine. Kim Stanley Robinson. Black Air.